UPDATE Dr. P contacted me to say his tires were at 8 32 meaning 1/4 of an inch tread not 3/4 worn. He still has another 25,000 to 30,000 miles to go on them. Also Dr. P. says he knows of a Tesla owner who already has done 50,000 miles so Gov Mooooooonbeam won't be handing out any back slap to Dr. P. Mr. J contacted me to say he is green because the grid in NJ has nat gas and nuke generation and I should not amortize the massive amount of electricity the Japanese used to fabricate his batteries over the miles he will drive. I will research the emissions from the NJ grid and try find out how many miles the batteries will really provide before I give Mr. J a detailed response. Jerry B did not respond as he is still recovering from the wounds he suffered in the Photo Shop. 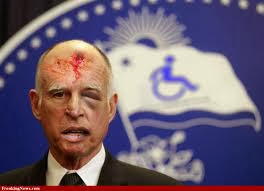 I did not do the makeup on the photo, I simply found it by Googling Jerry Brown Image. So far 2014 has been a wonderful year. My 1999 Mercedes C 280 passed its California smog test with flying colors and is now registered for another year. The registration process with the Cal DMV was online and very easy. Maybe Oh Bummer Care Dot Com can learn a lot from the Cal DMV. I remember the long lines and incompetent helpers at the DMV station in San Francisco thirty two years ago when I first registered a car in California. Going to the dentist was much more enjoyable than an entire afternoon inline at the DMV. Bravo Cal DMV you have applied the internet to make our lives so much more pleasurable. Inside EVs has published the 2013 sales of most EV vehicles in the USA and the Volt and Prius Plug In actually had negative sales growth over 2012. Makes sense as the plug in hybrid market now has other entrants such as Ford. The Nissan Leaf increased sales considerable and this was caused by a massive cut in price. Nissan still sold less Leaves than Chev sold Volts but those two cars both managed sales above 22,600 vehicles in 2013. The Tesla Model S sold about 17,650 vehicles in the US in 2013 and proved that more affluent buyers will use Uncle Sam’s money to attempt to be green. Actually all plug ins and all Evs were subsidized by Uncle Sam and some states so all buyers of these vehicles got some shredded pork shoulder. The total of all EVs and plug in sales for 2013 will be very close to 96,000 when Ford reports sales on Monday. The plug ins will be just over half of the total and the pure EVs will be just under half. In 2012 plug ins sold approximately 38,000 of 52,581 total. In 2013 pure EVs gained popularity more than plug ins primarily from the marketing success of Tesla and the massive price cut of the Nissan Leaf. I have opined that in 2014 we can expect approximately 140,000 plug ins and EVs to be sold and again the split will be roughly 50 50. The experiment with plug in cars has been expensive and has been partially successful. 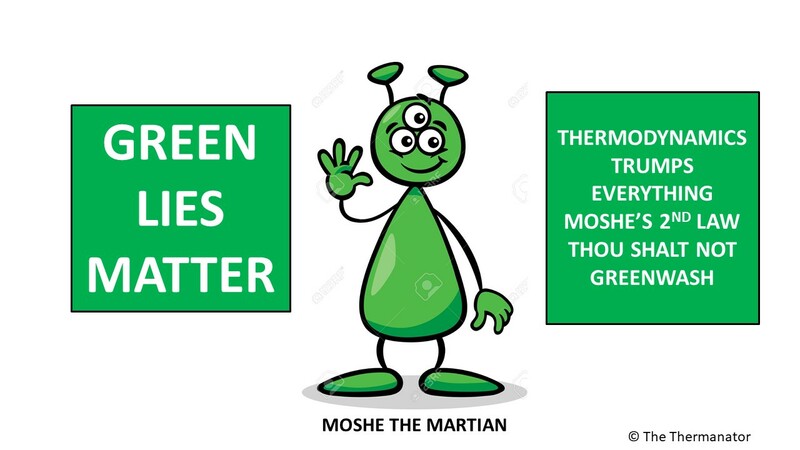 Certain drivers like Mr. Marsh Seattle have been marvelously green in using an EV for their high mileage commutes powering up with low carbon power from a green grid. Most Tesla owners did nothing to lower carbon emissions and simply sucked Federal and state money to lower their taxes. 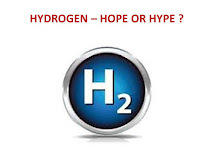 From the public policy perspective the EV story has been a waste of money (Fisker, A 123, Ener 1, LG Chem, etc. etc.) and even the Nissan story is a bust. Nissan will repay the DOE loan for the battery and Leaf plant in Smyrna TN but that plant was intended to produce 200,000 Leaves a year and Nissan has only achieved one tenth of its promised goal. Interestingly the United Auto Workers hopes to unionize the Fremont California Tesla assembly plant. It will be interesting to see if this happens or not. Talking of Tesla I did some math for a couple of friends who own Model Ss. The 5 fires in the Tesla is about the same incidence rate 0.025% as fires in the general fleet of all cars in the US. The one factor that is against Tesla is that the average age of the Model Ss on the road is six months and the average US car is 11.5 years old. Older ICE cars tend to catch alight more frequently than newer cars. Also the US fleet data includes cars that were ignited as a result of arson. From this analysis I think model S owners are more likely to see their cars go up in smoke but the likelihood is still small and I have told Dr. P and Mr. J. to save their money and not buy asbestos underwear. Mr. J. lives in NJ and the weather has been horrible. He took his extra money and bought thermal underwear as he informed me he did buy the panoramic roof option on his Model S. Poor Mr. J better not go on the NJ Turnpike at 77 MPH in 17 degree weather. Dr. P in Orange County CA is enjoying fine weather and claims he has almost 20,000 miles on his Model S. He has experienced two tows because of flat tires and his tires are ¾ gone and will need to be replaced soon. Perhaps Dr. P will be the first Model S owner to turn 100,000 miles and like Mr. Marsh in Seattle Dr. P will be famous and have the governor give him a pat on the back. Governor Moonbeam will say to Dr. P. “We are in a degenerate state of self-government. In fact, even to use the words self-government, is not only an exaggeration, it's a lie. It's a big lie!” Oops that is what he said in 1995. Governor B would now substitute the word greening for government.